It’s always a little weird when academia turns its attention on metal. From 2009’s (in)famous “black metal symposium” at Public Assembly (which did a great deal to launch Liturgy‘s career, for better or worse) to the controversial 2011 Melbourne University study that suggested that obsessive metal listening leads to suicide, academic studies of metal tend to generate more heat than light. The TL;DR version: on the average, metalheads are more openminded, less fond of authority and religion, lower in self-esteem, and more interested in being ‘unique’ than the average. Oh, and they’re mostly dudes. Surprise! Previous studies have reported reliable associations between personality and music preferences, but have tended to rely on cross-genre preferences at the expense of preferences within a single subgenre. We sought to overcome this limitation by examining associations between individual differences and preferences for a specific subgenre of music, namely, contemporary heavy metal. A total of 414 individuals from Britain were presented with clips of 10 tracks of contemporary heavy metal and asked to rate each for liking. Participants also completed measures of the Big Five personality traits, attitudes toward authority, self-esteem, need for uniqueness, and religiosity. A multiple regression showed that stronger composite preference for the heavy metal tracks was associated with higher Openness to Experience, more negative attitudes toward authority, lower self-esteem, greater need for uniqueness, and lower religiosity. In addition, men showed a significantly stronger preference for the tracks than women (d = 0.54). These results are discussed in terms of the psychological needs that contemporary heavy metal fills for some individuals. Yeah, not a lot of revelations there, though metal folk don’t always seem terribly high in “Openness to Experience.” Still, it’s nice to have one’s prejudices confirmed by Science. You can download and read the entire paper here, if shelling out $12 for a .pdf download is your jam. 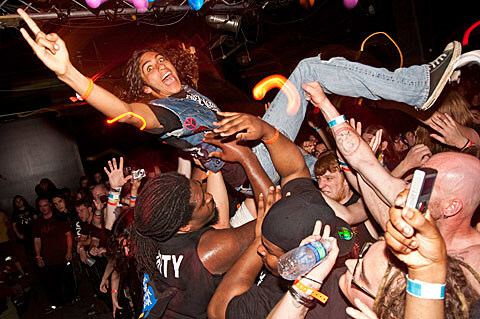 If your jam is more of the “going to shows and seeing heavy bands play music” variety, good news: there’s some killer ones over the next few days: Tombs/Primitive Weapons/Anicon at Saint Vitus tonight (11/8), Starkweather/Darkside NYC/Corrupt Leaders/Lords of Death at ABC No Rio on Saturday (11/9), and Circle Takes the Square/B Dolan/United Nations at Vitus on Sunday (11/10). Check out those shows and more (plus tix links) on our Invisible Oranges NYC metal show calendar. It rules.